The Oregon Ducks football team signed an impressive defensive lineman in this last recruiting cycle, plucking Rutger Reitmaier out of Tennessee. This is the third year in a row that the Ducks have signed a highly regarded prospect out of the Volunteer state. Last year Oregon signed All-World wide receiver Dillon Mitchell, a four-star prospect and Tennessee Gatorade State Player of the Year. And two years ago four-star cornerback Ugochukwu Amadi decommitted from LSU and signed with Oregon. 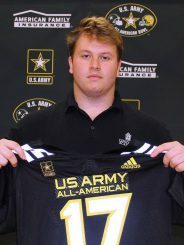 This year Reitmaier played in the prestigious U.S. Army All-American game. ESPN rated him with four stars and as the N0. 25 defensive tackle in the country, while 24/7 sports.com also awarded him four stars and considered him the tenth-best defensive tackle at his position. Reitmaier was a three-year starter for Lipscomb Academy, a small Christian school in Nashville. He was selected First Team 4A All-State (Tennessee), Region 6-4A League Most Valuable Player, and a Semi-Finalist for the Tennessee Titans Mr. Football Lineman of the Year (2016). Reitmaier is a big-framed kid. Most scouting services that I have seen list him at 6’3. His weight has been listed at 270 to 280 lbs. I have not seen any information on arm length or hand size, but this is typical for kids at this level. His SPARQ (Speed, Power, Agility, Reaction and Quickness) testing from the summer prior to his senior year of high school is very impressive. One does not normally see the combination of this level of athleticism, coupled with his size. Very unusual, and bordering on elite. To project his ceiling for his collegiate career, I did some research on three defensive linemen taken in the top fifty-five picks of the first two rounds of the recently completely 2017 NFL draft. (This sort of exercise is a common practice in scouting and personnel development.) The three athletes that I selected have very similar triangle numbers to Reitmaier. Reitmaier SPARQ tested better than all but Stanford phenom Solomon Thomas, the No. 3 pick overall in this draft. The other two were Demarcus Walker of Florida State, taken No. 51 by the Denver Broncos, and Dalvin Tomlinson of Alabama, taken No. 55 by the N.Y. Giants. They do not quite have the numbers that Reitmaier has, despite the difference in age when tested. Reitmaier was (I assume) 17 years old when he was SPARQ tested going into his senior year of high school, while the officially sanctioned numbers posted by Solomon, Walker and Tomlinson coming out of college were recorded at the NFL Combine in Indianapolis of this year. 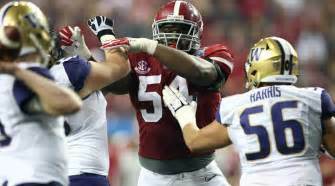 Dalvin Tomlinson in the National Semi-Final Game against Washington. In terms of maturation, four years is a significant length of time in development for a kid at this stage of his football career. Typically kids fill out and put on more good weight in college. And as they grow into their bodies, they gain a half step in speed and quickness. It’s why Clay Matthews, Jr. was a better player in his third year in the NFL than he was coming out of USC, even though the Green Bay Packers took him overall No. 26 in the 2009 NFT Draft. Sophomore Highlights #1: In the video above, Reitmaier demonstrates his bull rush technique for a Tackle For Loss (TFL). 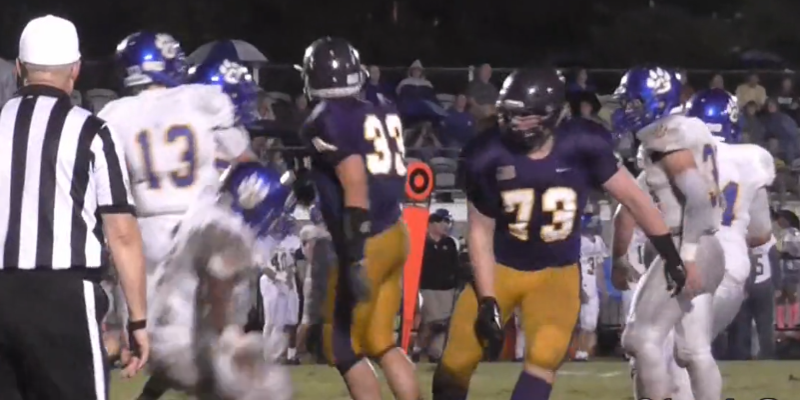 Sophomore Highlights #2: Reitmaier dips his shoulder to get past the center for a Forced Fumble (FF). Sophomore Highlights #3: Reitmaier again dips his shoulder and demonstrates a lightning-fast first step. He beats the offensive tackle to the hole before his opponent comes out of his stance! Junior Highlights #1: Reitmaier overpowers his opponent in a classic Bull Rush up the middle. Junior Highlights #2: Reitmaier demonstrates great cutoff angles in pursuit. Senior Highlights #1: First “swim” move I have seen on film from Reitmaier. Senior Highlights #2: Reitmaier collapses the pocket from the edge. Reitmaier is the prototypical 3-4 defensive end. If he were taller, his best position would probably be left tackle because he is so athletic. If he were a few inches shorter, he would be a defensive nose tackle all the way. Defensive Line coach Joe Salave’a has a lot to work with here. Reitmaier has some technique work that needs to be done before he sees the field, but most of his flaws are minor issues such as cleaning up his swim move. Based on the information that I have seen, including video, SPARQ testing and “similar athlete” comparisons, Reitmaier carries a solid second-round grade in the NFL Draft if he comes out three years from now. With a redshirt year, it is conceivable that he could slip into the bottom third of the First Round. In terms of triangle numbers, athleticism, and “want to” Reitmaier reminds me a lot of Chris Long. In fact, Reitmaier’s Senior Highlight video #2 is nearly a carbon copy of the Chris Long video above. It is difficult to evaluate potential talent from very small high schools. It is not at all likely that a Division 1 football player at a small school is going to play against other college-bound talent every Friday night. The film evaluation is of little help because the subject of the evaluation (Reitmaier in this case) is a genuine Division 1 football player…and other kids in the highlight videos are not. In cases like this, one has to trust the triangle numbers that the kid has legitimately been tested at, and apply the “similar athlete” approach to provide perspective. Established NFL players such as Kony Ealy, Paul Kruger and Corey Liuget help provide a feel for Reitmaier’s “ceiling” after college. All three of these guys possess similar size, talent, and background to Reitmaier, which helps to develop an informed opinion of him. 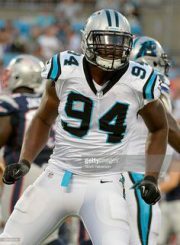 Kony Ealy August 28, 2015 in Charlotte, North Carolina. Reitmaier has posted some very impressive numbers at a young age. He is a physically imposing guy who is only going to get bigger. And faster. He is great athlete bordering on elite–level athleticism. His first step at the snap of the ball and his motor are elite level. He is a dominant force against the run and can really set an edge. He is not a finished product, however. 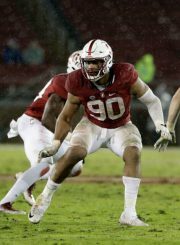 He needs to clean up some technique issues to become an effective inside pass rusher at the collegiate level. There will also be an adjustment period because the jump from a small high school to big-time Division 1 football is a quantum leap in the size, speed and skills of the opponents that he will face. Having said that, I am confident that he will see the field early in his career at Oregon. For more Talent Evaluations, click here.